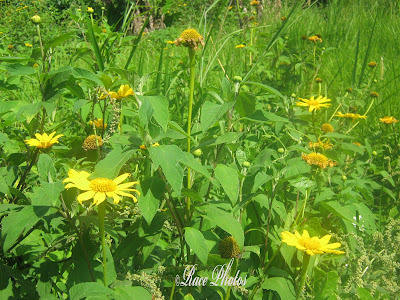 I've taken the shot at Villa Dominga Resort in Indang, Cavite where sprawling wild sunflowers are just growing up in one corner of the villa. I'm just amazed of how good the soil is in that part of Cavite because even if the flowers are not tended and cared for everyday they just grow up like grass. Sad thing is the bees and other insects sometimes ruin the petals of these lovely sun yellow blooms. I love sunflowers because they so vivid in color and when you see them in big group like this you'll feel like the place is full of sun with those beautiful golden yellow blooms opening up their petals for people to realize the wonderful creation of God! Love the green and yellow contrast. I love sunflowers, too. Thanks for sharing.